Regardless of what Edgar Allen Poe would have you believe, being visited by a talking bird doesn't really seem all that ominous -- even if it's a little fun to pretend it is. In this video, uploaded by YouTube user Jordan Cook, a clever raven named Toby stops by a man's window sill for chat, and to cause a bit of mischief in the yard below. 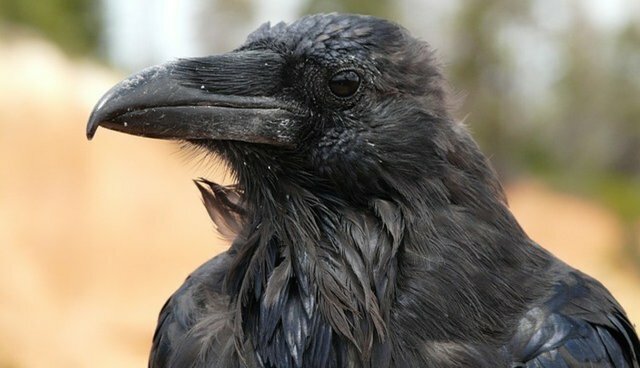 "My friend's landlord has a smart pet crow/raven that spends its time tormenting tenants by repeating his own name and tapping on windows," writes Cook, though the bird's low caw suggests it is the latter species. Like parrots, ravens can be taught to vocalize like this, though it's better that most not get the chance. Under the Migratory Bird Treaty Act, it is illegal to keep ravens (or crows that matter) as pets without a Federal permit.